Missouri lies within an important region for monarch butterflies. The state serves as summer breeding grounds for the insect and it holds a portion of the monarch’s migratory flyway. 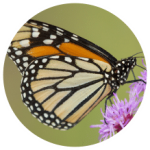 Monarchs are used to understand metamorphosis, mimicry, migration and coevolution. They are indicative of our relationship to the environment and represent the beauty and importance of diversity in nature. A loss of biodiversity harms the ecosystems that help support life. Sustainable ecosystems are diverse ecosystems. Without a fully functioning ecosystem, we lose those services. 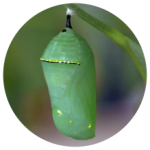 Monarch butterflies experience a complete metamorphosis during their lifetime. The four stages take around 30 days for monarchs to develop from egg to butterfly. Females lay eggs on their host plant, milkweed. 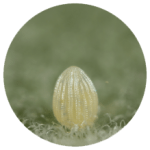 The eggs are usually laid on the bottom of milkweed leaves. This is crucial for development because milkweed is the only plant the caterpillar will eat when it hatches. On average, females lay around 300 eggs, all the size of a pinhead. 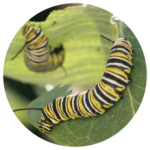 Once the eggs hatch, caterpillars solely rely on the host plant, milkweed, for food and shelter. Caterpillars are constantly eating and growing. They undergo five molting stages called “instars” where they grow up to 2,000 times larger than their original size. At the end of the fifth instar stage, the caterpillar ventures to a secure location where it will hang in an upside down “J” shape, held to the surface with silk pads. The caterpillar molts one last time before revealing the chrysalis. The cellular changes that occur in this stage make it possible for the monarch to sip nectar and fly. Before breaking the chrysalis, it appears translucent from the pigmentation in the wings. When the monarch emerges, it spends a few hours drying its wings and pumping fluids into them. It then looks for its first food source. At this stage, monarchs are reliant on nectar-rich sources to fuel them for mating and/or migration.